One More Reflection: Do great things. America will be number one again. Be a winner. Make America great again. This is the way the world thinks and we do as well. Serving is not natural, that is, according to fallen human nature which is self-centered and ego driven, and so self-serving, damaged in the Fall, damaged beyond all human repair. When I re-read Pr. Loehe’s reflection above, this is not the Christianity I want. I want successful and powerful Christianity especially in our mission here. I think that the lamentation, “America is no longer a Christian nation”, is the lament over lost power and influence. Christianity had the moral high ground for some time, but immorality was still committed. The Church had no political power and authority when Dorcas, Lydia and Phoebe lived upon this old earth. When it does boast political power, then the dangers abound. As our Lord said to Pilate, “My Kingdom is not from this world.” The Church did have power and still does: the Word and Deed of Jesus Christ in the lives of His faithful people. Kings and the mighty change the world according to their will and things get worse. They make news but it is really as “old as Adam”. The faithful women did good things in Christ Jesus and Faith, according to the Lord’s gracious will and they were salt of the earth, and people believed in the Lord. We think our smartphones are just wonderful and adorable, the gadgets of power and we listen to them. We need to listen to our Lord in His Word Who alone can change our souls day by day to love as He first loved us. These holy women, who were made holy by Faith in Jesus, are acknowledged in the prayer above in their various vocations: business woman, charitable worker and deaconess. For instance: Lydia was the first convert to the Faith in Europe. And as a business woman who sold the dye of royal and costly purple, she might have been quite well-to-do. I am struck by the non-judgmental listing of “business’ alongside with a “churchy” sounding word, “deaconess” in the prayer above. These are all vocations from the Lord, yes, even business! If it weren’t for business, there would be no jobs. There is no occupation that is displeasing to the Lord, except those occupied with evil…or vocations used for ignoble ends with sinful means: as in too many presidential campaigns. Even a ‘churchy’ vocation can be used to serve self and not the Lord and can become evil as witnessed by clergy sexual sins. And business men and women can serve the Lord and His people, and not the self. Daily repentance is turning toward the Lord our whole lives to serve Him and His people. It is in our daily vocations that we can serve and love our neighbors as to Christ Himself, not to save ourselves, as Jesus has already done that, but that our neighbor be served and be pointed to the Savior. 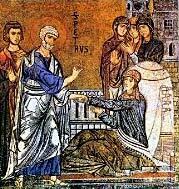 Dorcas, Lydia and Phoebe did so by charity, hospitality and serving, not waiting for suspect government to help the poor, the stranger, the widow, but actual acts of of corporate mercy. These holy women, who were made holy by Faith in Jesus, are acknowledged in the prayer above in their various vocations: business woman, charitable worker and deaconess.